If you want to submit your ITR Online than it is mandatory to register on Income Tax India Filing Portal. So today in this article we will guide you How to Register on Income Tax e-Filing and Link your Aadhaar Number. The main requirement to register on Income Tax e-Filing Portal is you should have PAN Card, if you have PAN Card available with you than you can carry on following below process on How to Register on Income Tax e-Filing and Link your Aadhaar Number. To register just visit Income Tax India Filing Portal registration page by clicking here. 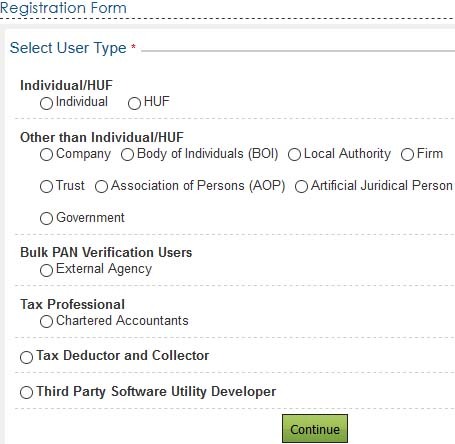 Once you are on e-Filing Income Tax Department page, start filling the registration form by selecting user type whichever is applicable for you and then click on continue button. On next step 1 you will have to enter your basic details like PAN Number, Surname, Middle Name, First Name, Date of Birth and click on continue button to proceed. 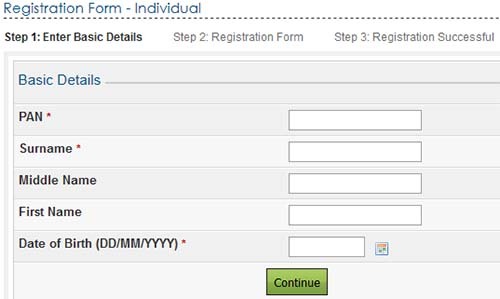 In step 2 registration form you will be asked to set password for your account, set secret questions which will help you during account recovery, enter contact details like mobile number, email id, enter current address like flat/door/building, road/street, area/locality, pincode, state, country, enter the captcha code displayed in image in below text field and click on submit button. On next page you will get message saying registration successful, thank you for registering in e-Filing and it will also mention transaction id. A link to activate your account will be emailed to you and an OTP PIN will be sent to mobile number. So to activate your account just click on activation link which you have received in email, and enter the mobile pin which you have received on your mobile number and click on submit button. That’s it your User ID will get successfully activated, now you can login into your account by entering your User ID, Password, Date of Birth, solve the captcha and click on login button. Once you are logged in into your account it will prompt you to link Aadhaar, linking Aadhaar will allow you to e-Verify your return using Aadhaar. But before linking your Aadhaar Number to PAN make sure you verify if your name, date of birth, gender as per Aadhaar Card matches the details as per your PAN data. So in below Aadhaar Number field just enter your Aadhaar Number solve the captcha code and click on Link Now button. Income Tax Department will validate your name, date of birth, gender as per PAN and Aadhaar Number with UIDAI, and once the validation is successful, your Aadhaar will be successfully linked to your PAN. 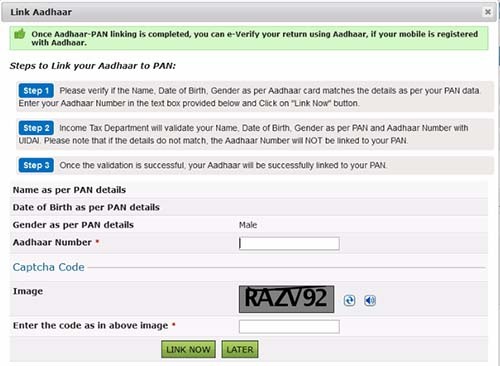 That’s it you have successfully completed linking your Aadhaar with PAN and now you can file your returns online.